Boost your energy with HealthVit Mulvit. MULVIT is fruit flavoured tablets with 35 important vitamins, minerals, amino acids, nutrients and trace-elements. 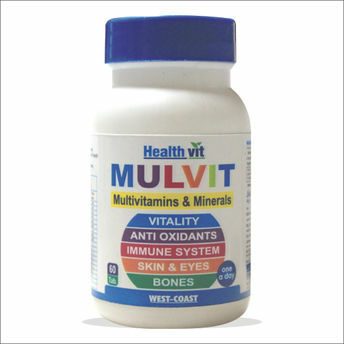 MULVIT is used as Energy booster, an antioxidant, helps to build immunity. It also helps to keep brain active, checks hair loss and graying. For healthy heart, blood & eye sight, Helps to compensate for dietary deficiency, Checks blood sugar & cholesterol level. Explore the entire range of Multivitamins available on Nykaa. Shop more HealthVit products here.You can browse through the complete world of HealthVit Multivitamins .